Analysis shows that guns are the element that deadly attacks have in common. 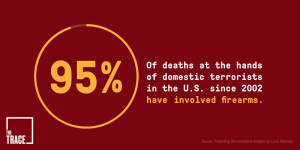 Since 2002, guns have been responsible for 95 percent of all deaths at the hands of domestic terrorists. When thinking about terrorism in the post-9/11 era, we should think Charleston, not Boston. The former is the new paradigm; the latter not so much. What we witnessed in South Carolina’s seaside haven fits the new norm of violent political extremism in the United States. Deadly terrorism now comes out of the barrel of a gun. The armed assault on parishioners attending a bible study and prayer session was initially treated as a hate crime: an act of violence motivated by bias against a race, religion, ethnicity, sexual orientation, or disability. Roof, after all, had reportedly told one survivor that he targeted the victims because they were black. But with his alleged attack, Roof also reportedly hoped to inspire a civil war pitting whites against blacks. This clearly political motive makes his actions terrorism under the statutory definition.